UNEX Manufacturing, Inc., the trusted industry leader in innovative order picking solutions, celebrates its second consecutive year of record business growth in 2017, adding dozens of new products and solution patents, major industry awards and global sales throughout North America, Central America, Europe and Asia. 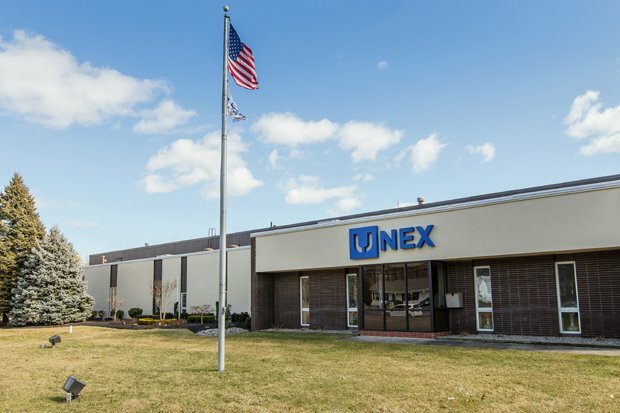 UNEX now employs over 100 people, making the company one of the largest employers in Ocean County in New Jersey. UNEX has invented dozens of products and solutions in response to customer needs, for which the company has been awarded patents. UNEX is the pioneer of Span-Track®, a universal flow track system that easily drops into any supporting frame or pallet rack. UNEX continues to define the current gravity conveyor marketplace with additional modules and features for Span-Track, making it one of the most durable, flexible, made-to-order picking solution available. UNEX Flow Cell®, Roller Rack®, Shelf Track®, Pallet Track®, Pick Shelves and Gravity Conveyor are made of durable steel materials that eliminate hang-ups on tracks and carry more weight and products than competitors. UNEX products speed throughput up to 150%, carry a 7-year warranty and increase space utilization by up to 50%. One recent invention includes the UNEX Pick-Plank, a mechanical order picking device that affixes to a pallet and converts each pick slot from a static to a dynamic storage position, allowing all items on a pallet to be accessible from the aisle. It is suitable for case picking less than full pallet from a man aboard order picker, eliminating the need for the picker to have to reach or crawl into the storage position. UNEX Manufacturing introduced industrial carts recently as well, used to move materials, parts, boxes and components from one location to another within assembly operations. Carts are available with open shelving or racks to hold cartons or parts, improving picking operations and boosting productivity. UNEX Manufacturing helps manufacturers and assemblers boost productivity, improve ergonomics, eliminate waste and maximize space with their lean, modular workstations. Our lineside storage solutions improve picking operations within assembly. When customization is high in an assembly operation, having the ability to store additional SKUs in the assembly area means pickers don’t have to travel to find the right part, speeding fulfillment rates. Efficiencies and productivity are increased as well.